In a land forgotten from mankind, was a region known as Aria. This land held many civilizations based around legendary and Mythical pokemon that helped their ancestors in the past. Due to their worship and peaceful ties, the legends and mythicals bestowed a fraction of their powers to any human of their choosing, known as The Chosen. These humans were raised and given a sacred items, given the mission to protect their land. Little did they know that darkness crept close with the rise of a nation, which only had the thirst for conquest and the abilities of the chosen. After destroying towns, taking numerous of lives, and capturing a few of the chosen, these civilizations sent the youngest ones to a safe haven. It's been a couple of years since that day, and the darkness is moving closer by the hour. Do we have what it takes to protect what is ours? -No one can have the same chosen legendary/mythical pokemon, unless both of your characters are twins. -You can pick any power that the Legendary/Mythical pokemon have, just make sure not to be OP. -You cannot choose Arceus, he will play a role in the story. -You can be semi-literate, so you can use one liners. Please try your best and add some description. -Everyone has the automatic ability to speak to pokemon. -You are given a pokemon before you were sent to the safe haven. It can be any pokemon, at any stage evolution, Shiny or non-shiny, except for the Legendary/Mythological pokemon. With that, you can still command pokemon you befriended . -In this RP, Type-Null isn't considered a legendary/mythological pokemon. -Romance is allowed, just don't make it a the center of the story. -There can be up to 5 people in each house, except for house 5 and 3 having only one resident. -You have been living with these people for a few years, you are bound to know them. Personality: Lily is a confident and quite outspoken. She usually has her emotions take control of her. She does learn self-control and controls them when needed, but she sometimes needs help. She is also sweet and kind, but can be oblivious. Ability: She can make and dismiss weather in a certain area. By playing her sacred item, she gains a damage boost and Rayquaza's typing, but has to play the full song which takes her about a minute to do so. Ability: Her singing voice can control anyone she chooses, as long as they listen to her song. She can also boost her allies stats as she sings. If she plays or sings a song in her tome, she can increase her own attack and become more offensive than supportive. Appearance(Photo or description): She has pure black hair and pale skin. She often wears a black lace dress with a pair of low heel shoes. Personality: She has a twisted sense of passion and love. She loves nothing more than to kill anyone who is innocent. It's unknown why she became like this, maybe it was the corruption of her soul. Sacred Item: A bladed fan with a purple crystal in the middle. Personality: He's usually silent and is cold to others. He hates it when others underestimate him, and would freeze them in their tracks. Sacred Item: A pure white sword. Ability: He can freeze anything he wants in a radius around him, including the air. Other: Something about him seems off-putting. Appearance(Photo or description): He has black hair and golden eyes and wears a robe made of silk. Personality: He's kind-hearted, but might come off as spoiled to others. Sacred Item: A flute he wears around his neck made of Opal. Ability: He is able to create objects just by playing his flute, tho he is limited by only one object and it must weigh under his own weight. Ability: She can Boost her allies stats but only if Its midnight. Appearance(Photo or description): Shoulder length brown hair. Green eyes and plaid jackets. Tights and sneakers. Um, you can pick other items then flutes, like weaponry, acceories, etc. But, if you wanted a flute, that's alright. Other than that, everything is okay. Appearence: green leather jacket, blue jeans, brown hair. 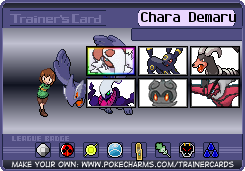 Ability: Can cause a small group of people and pokemon (including self) to get a boost in strength, confidence, and agility, however, it can only be used once a day IF the user has taken time to recover. Personality: Silent and very serious. He is very anti-social, but would like a freind to share with. If you know me, you must have fun with the Joker... Just kidding, from me everyone is welcome! How many people do we need to start? I think we can start right now, just let me make the link. Also, i didn't think that this many people will apply in one day. Well for a little i will be off, so we will see when i woke up, bye guys! Appearance(Photo or description): White everything except hair and eyes, which are blonde and green respectively. Personality: Changes depending on several factors. Sacred Item: Color-changing amulet, color depends on current personality, pink being reserved for when bodies are swapped. Ability: Can swap bodies with others for a while. Are you okay with sharing a home with someone? : Yes, if you count as staying alone in a room with other people in other rooms as sharing a home. Okay, i came up with something and added it. Waiting for approval. Accepted. Also, i'm just making this clear. You know everyone in the save haven, and everyone knows you. That goes for everyone.